A classic peanut butter cookie – soft on the inside and crunchy on the outside. They’re made with Chunky Peanut Butter and rolled in crunchy sugar in the raw. If you love Chunky Peanut Butter, you’re going to love these Chunky Peanut Butter Cookies. Every so often when my husband has a sweet tooth, he decides to bake something. Usually it’s banana bread to use up overripe bananas, but often it’s cookies. Cookies are always a big hit at our house, and one of our favorites are these peanut butter cookies. The recipe was a cookie of the week on Martha Stewart’s show in 1998 and we’ve been making them ever since. We’ve updated it to use Chunky peanut butter and Sugar in the Raw. My husband loves the extra sweetness and crunch that Sugar in the Raw gives to baked goods. He tops his banana bread with Sugar in the Raw and loves to roll cookies in it before baking. Using a scoop to portion out the cookie dough makes baking cookies, quicker, easier, and more fun. The purple #40 scoop is the perfect size for cookies. I’m in love with the glass storage container I put the sugar in to roll the cookie dough. You want something that’s not too big so you don’t waste sugar. If you don’t like the extra crunch of Sugar in the Raw, you could roll the cookie dough in regular table sugar. If you don’t like peanut pieces in your cookie, substitute creamy peanut butter instead. We like our cookies soft in the middle, but if you like your peanut butter cookies a little more crisp, flat them a little bit before baking. In a small mixing bowl, whisk together flour, baking soda, and salt; set aside. Cream the butter and sugar in the bowl of an electric mixer using the paddle attachment. Add the egg and vanilla and beat until combined. Add the peanut butter and continue beating on low speed. Add the dry ingredients and beat until just blended. Heat the oven to 350 degrees. Line a baking sheet with a silpat. 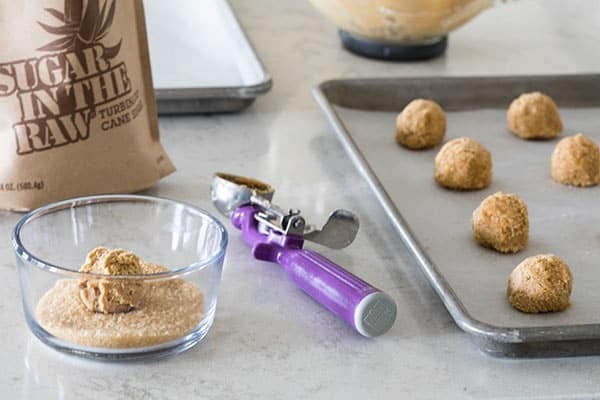 Form dough into 1-inch balls. Roll balls in Sugar In The Raw. Place balls on cookie sheet about 2 inches apart. Press down slightly with the palm of your hand. Bake until rich golden brown, about 10 minutes. Transfer to a rack to cool. To the reader who said that her cookies did not crinkle, my cookies were smooth on the top too. I raised the temperature to 375 and that fixed the problem! I baked them for the same amount of time and they came out great! You do have to flatten them because they won’t spread. When I made these my cookies did not crinkle. What did I do wrong? Hi Lacy – perhaps they need a bit more flour? Al time favourite ! Thank you ! One of those with a cup of tea would really make my afternoon much more fun! Thanks for all the sweet comments on the cookies. I’m definitely lucky to have a hubby who knows his way around a kitchen. They look so pretty Barbara! Peanut butter cookies are some of my very favorite! 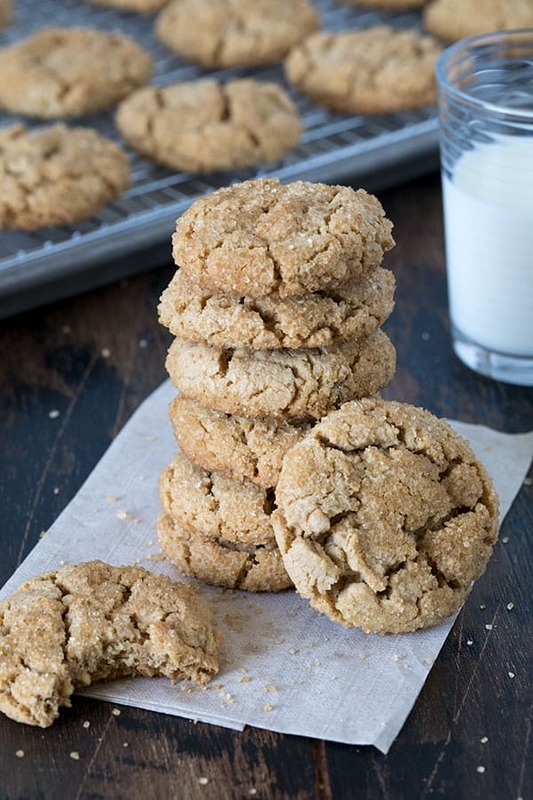 My husband loves Peanut Butter cookies… will be giving these a try in the near future! I’m new to the world of bloggin’… thanks for the friendly comment! Love that your hubby baked these cookies! 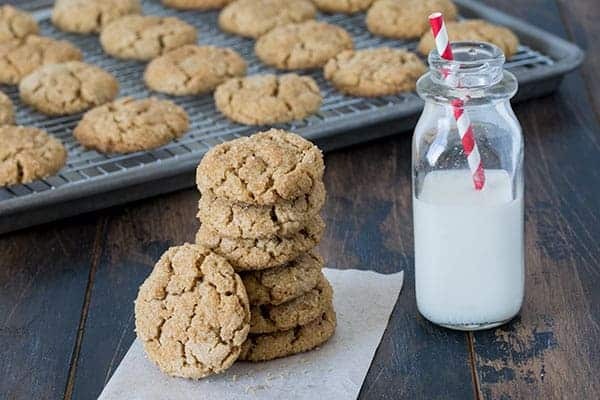 Peanut butter cookies are a favorite, will have to try this recipe out! I think I would faint from surprise if my husband ever baked anything! He’s a great cook, but I don’t think he could bake to save his life. These cookies look perfect! those look so good! my Dad is a big peanut butter cookie lover. I will have to try these. I love this classic recipe. These look amazing!!! Check out my blog–I gave you an award. Your blog is just awesome! Peanutbutter cookies is one of my daughters favorite. These look great. Kudos to the hubby-I’m impressed! I don't think I'll ever see Grumpy in the kitchen making anything unless its a can of soup or boxed mac & cheese!